Dodgers lefty Clayton Kershaw threw to a catcher today from flat ground, J.P. Hoornstra of the Southern California News Group reports in a series of tweets. That still counts as notable progress for the vaunted hurler, who also long-tossed and does not seem to have reported any issues. Shoulder issues have slowed Kershaw thus far in camp, but he has seemed to be on the upswing of late. Filling in for him early on shouldn’t be a problem for a Dodgers club that has a deep staff to call upon, but the early health issues are of greater concern given the recent history. Kershaw, who’ll soon turn 31, has now missed starts in each of the past three seasons and is under contract for three seasons and $93MM. The Tigers have announced that they have sent young outfielder Juan Ramirez to the Astros. 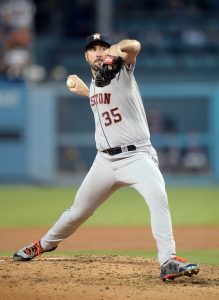 He becomes the player named to complete the late August blockbuster that sent righty Justin Verlander to Houston. In exchange for that pair of players, as well as $16MM to cover some of Verlander’s remaining salary, the Tigers picked up a trio of prospects. Righty Franklin Perez, outfielder Daz Cameron, and catcher Jake Rogers were all added to the Detroit farm system. Coincidentally, the announcement comes on the eve of Verlander’s scheduled ALCS start. The swap has paid dividends for Houston thus far, as the veteran starter has been outstanding. Of course, the Tigers are far better served by interesting young talent than by Verlander at this stage. Ramirez, now 18, landed with the Detroit organization as an international free agent back in 2015. He landed a $185K bonus to sign out of his native Dominican Republic. Ramirez saw 46 games of action this year in the rookie-level Gulf Coast League, turning in a .301/.385/.362 batting line with twenty walks against just 14 strikeouts. Despite the clear lack of power, that sort of approach holds obvious appeal.